The state of Georgia has played an important role in the development of the game of golf in the United States. Bobby Jones, one of the most recognizable names in the game of golf thanks to his exceptional amateur career, grew up in the area and was behind the creation of one of the country's most exclusive courses, Augusta National. Home to one of the PGA Tour's four annual majors, The Masters, welcomes the top players in the game and thousands of spectators to their hallowed grounds to award the heralded Green Jacket. However, this isn't the only course you have to visit during your trip to Georgia. Check out these other great courses the state has to offer! When it comes to the pinnacle of American golf, The Augusta National Golf Course is in the forefront. Designed by Bobby Jones and Alister MacKenzie, Augusta opened its clubhouse doors for the first time in 1933. Augusta was built to challenge the best golfers on the planet and it regularly does, creating some of golf's most unforgettable moments. The beautiful landscape accents the iconic buildings and notable holes, creating an unforgettable golf adventure. This top course has been home to the Masters Tournament (one of pro golf's four major tournaments) since 1934. Unfortunately for visitors who want to play a round or two, this is a private course with an invitation only membership policy. The only way to golf this course is as a member. If you're interested in seeing the course the next best way is to walk the grounds during an event. In 2012 Augusta National Golf Club opened its membership to women for the first time. The winner of the Masters Tournament receives the iconic green jacket. Each of the holes at Augusta National is named after a flower. The King and Prince Golf Course was originally designed by Joe Lee and built in 1989. He used the natural formations to create a golf course that appeals to golfers of all levels. It is an 18 hole, par 72 course and it stretches about 6,500 yards. The course is known for its four signature salt marsh island holes. It features over 800 feet of raised bridges to access the island holes and traverse onsite lakes and ponds. In 2009, the course was redesigned by Billy Fuller giving the course a makeover that will ensure top tier playability into the future. The course is covered in beautiful green native grasses that accent the layout and bring unique look to the area. Many of the fairways are lined with oaks, salt marshes, lakes, and lagoons. These natural features give the player different vistas on each hole. The resort has free transportation to the course and the staff is ready to help with all of your golf needs. St. Simons Island has a area of 17.9 square miles. 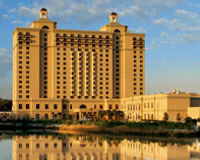 If you're planning a group golf getaway, check with the resort for special group rates. When you stay at Westin Jekyll Island, you are steps away from a round of golf at the world-class Jekyll Island Golf Club! Players from all over the world and acclaimed designers have visited Jekyll Island, Georgia, for its amazing golfing opportunity. You can enjoy a great tee time on the masterpieces Jekyll Island Golf Club. What are you waiting for? Get your family or friends all gear up and enjoy a round or two of golf at this 63-hole course. The island’s most pristine lakes and marshes are right here, enjoy the view during your game! Traveling to the breathtaking natural wilderness of St. Simons Island to the Sea Palms Resort, home of the Sea Palms Golf Course. Set among the lush sea of green that the forest of St. Simons offers, the Sea Palms Golf Course is a unique golf experience. Opening in 1967, this course was designed by George Cobb and Tom Jackson. They aimed to make a course that players of any skill level could enjoy, while embracing the natural habitat and vegetation. The Sea Palms Resort is home to two courses. The main course is a par 71, 6,500-yard layout. The resort also features a nine hole executive course. The executive course offers Footgolf, a mix of soccer and golf that uses shortened length holes, bigger cups and a soccer ball instead of clubs and golf ball. The staff is diligent and stands ready to help with tee times, tournament planning, lessons and scoring. Whether ýou’re just beginning or ready to tackle a full 18, this course has something to offer every golfer. The island has a population of over 13,000. On average St. Simon Island has 219 days of sun each year. The Lake Blackshear Resort and Golf Club, home to the Georgia Veterans Memorial Golf Course. Nestled on the shores of Lake Blackshear, this course provides golfers of all ages and abilities a picturesque setting for a Georgia golf getaway. Built in 1990 and designed by Denis Griffiths, it is one of two privately run courses in Georgia that are located on state land. This 18 hole course challenges players with a total length of 7,059 yards and teeing off from the back tees presents golfers with a unique challenge. The course itself is well maintained and covered in mature trees and plants, sand traps, lake views, water and hills. This public course averages over 20,000 rounds per year and is ready for your Georgia golf getaway. This course specializes in large groups and events, so if that's your prerogative then they can help. Cordele, Georgia has a population of 11,187. Located two hours from Atlanta and one hour from Macon. Located just outside of Atlanta, The Barnsley Garden Resort features a par 72, 18 hole and 7,350 yard course known as The General. The course opened in 1999 and was designed by Jim Fazio. His goal was to design a course that would resemble Scottish courses. He used the natural environment to enhance the rest of the course. He walked the grounds and hand choose the entire 378-acre layout. The resort prides itself on the unique views of nature that each hole provides. Awe inspiring mountain views can be enjoyed from different vantage points all over the course. In addition to accommodating experienced golfers this resort is filled with professional training opportunities in areas such as short game, long game, putting, swing mechanics and even course management. The rolling fairways and fast greens provide golfers with one of the most challenging and enjoyable rounds of golf in the southeast U.S. The average temp for the year in Adairsville, Georgia is over 71 degrees. 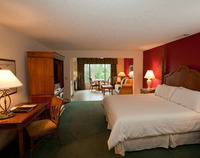 Barnsley Garden Resort runs specials and packages all year. Contact them to see what they are current running. The Club at Savannah Harbor provides a premium golf experience while overlooking the beautiful downtown Savannah skyline. Tucked away on Hutchinson Island between the Savannah and Little Back Rivers, this course is a unique setting for any golf getaway. 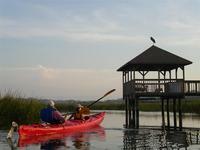 The natural features that highlight this course include tidal marshes, wetlands and an abundance of wildlife. Designed by golf legends Sam Snead and Bob Cupp, this course is included on the PGA’s Champions Tour, with their Liberty Mutual Insurance Legends of Golf event. The 18 hole course is meticulously maintained by the world famous Troon Golf Course Management Company. No matter the experience level The Club at Savannah Harbor gives golfers a professional level round while enjoying the landscape that the Savannah area is know for. Savannah, Georgia has a population of over 140,000 people. Located on Jekyll Island, the course is set against an ocean background and lies within the Jekyll Island State Forest. The resort offers all golfers an unforgettable experience. The original golf course opened in 1898. It was designed and built by its members. Currently the complex houses three 18 hole courses including The Oleander, Indian Mound and Pine Lake courses. Jekyll Island Golf Club also has the popular Great Dunes course, a nine hole executive course. The grounds crew takes care in maintaining the locally sourced vegetation, giving the course a clean look and play through. The friendly staff is educated in golf and prepared to help you with your game and golfing needs. Make sure to check with the golf club because they offer deals and membership discounts. If your looking for events besides golf to add to your getaway then don't look further than the hotel. They host cooking classes, murder mystery and yoga. Jekyll Island is part of the Golden Isles of Georgia.